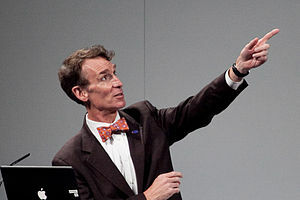 Bill Nye the Science Guy was eliminated from Dancing with the Stars last night. Which just might have been the best thing for him. He suffered a torn tendon in his knee and the doctor did tell him not to dance. Or maybe it was decided that he shouldn’t be on the show anymore is this is how they were going to do it. So, I’m done with the show now, unless they decide to cast another icon from my childhood. Be warned fans of the Science Guy, this video is a little heart breaking.